Quick Checks are brief measures used to monitor student progress in between the three main screening/assessment windows (fall, mid-year, spring) and to determine the effectiveness of instruction and intervention. Quick Checks are accessible via your PALS Online System account, where Quick Check progress charts and summary reports are generated as scores are entered. 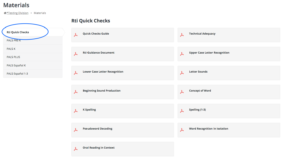 A Quick Check Guidance document is also available there to provide specific information about using Quick Checks. Where do I find Quick Checks? What skills can I monitor using Quick Checks? How do I evaluate whether a skill has been mastered? How do you know when to move on to the next skill in the student’s literacy intervention instruction? As the goal of literacy intervention is to ensure that foundational literacy skills are truly solid before moving on, each Quick Check provides guidelines for evaluating when a student has mastered a skill. Click here to view a summary of Quick Check mastery guidelines.